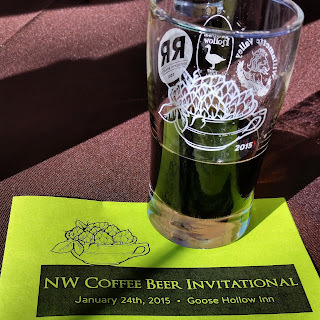 Last week was a BUSY one over here - talking about beer events, attending beer events and then over the weekend judging beers in Bend. With all that going on the Best Things fell by the wayside. To make up for that we'll double up starting off with the middle of January. This was an exceptionally good week for beer with the highest notes all coming from Oregon breweries. Some of these are more readily available than others but with a little looking any of them should be available. Culmination Oregon Kara Sakura - Brewed for the Japanese market, specifically the Cherry Blossom Festival, most of it was shipped to Japan with the remaining, limited supply available in their tap room. It was brewed with wild yeast, Oregon cherries and rose hips from Jasmine Pearl Tea Company (just down the street from Culmination) with the result being a delicious, mild sourness. Burnside Gin & Joose - Saisons aren't generally at the top of our list but put them in gin barrels and ta-da, magic! This French Saison aged in Ransom gin barrels with peaches, strawberries and lavender is a complex beer that is both imminently drinkable and something to covet. Crux Stout - Dark as one would expect from a stout, Crux puts their own twist on this style with a beer that has great body and mouthfeel to compliment the dark coffee-chocolate-caramel flavors. The simple name belies the obvious craftsmanship that went into the brewing of this beer. 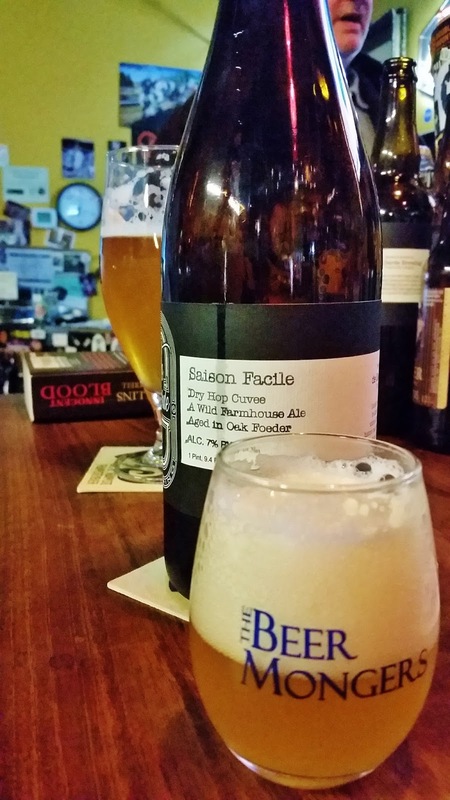 de Garde Saison Facile and the Dry Hop Cuvee version - de Garde is a bit of a polarizing brewery both in terms of their beers and their availability. One may recall that when they started very little was distributed; to get it meant a trip to Tillamook or friends who would bring some back. These days the supply is more abundant although the most special beers still require a trip. This rings a sour note for some. For others the sour notes in their beers, which we're a fan of, come across as one-dimensional. To each their own. This beer, or rather these two beers, that Chris shared with us were a fun back-to-back comparison. Both were great tart beers but the Dry Hop Cuvee slightly edged out the other providing stronger citrus notes and less effervescence. 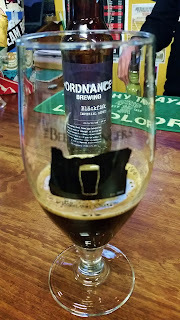 Ordnance Of Chimpanzees Porter - Ordnance makes an appearance on the list for the second consecutive week with a coffee beer that uses Home Town Coffee Roasters coffee and has the aroma and flavor of cold brew. The name is a bit weird but has a great story. Coffee fiends will want to swap out their morning brew for this! And at a drinkable 5.3% perhaps you can. Style preferences, at opposite ends of the color and flavor spectrum, once again showed themselves this week. Dark and coffee anchored one end with light, fruity and sour at the other. We might be somewhat predictable but we do keep it diverse. Saturday will be a GREAT day to be a beer lover in Portland! And we'll be out of town...but in another good beer town (Bend). So that you can plan your day, here's a rundown the things we'd be deciding between. Do one or do 'em all! This is the event I am most bummed to miss! Being a coffee fiend and having attended for the first three years breaking the streak is bittersweet. This year the event will feature 14 breweries and 2 cideries inside a cozy tent in the Goose Hollow Inn parking lot. The location makes parking challenging but historically this has been one of the most enjoyable festivals we've attended due to both the small size of it and, duh, coffee beers! Dave Fleming and his wife Jean bring the neighborhood feel of the Goose Hollow Inn to the tent for a festival where you're likely to see more people you know than you have time to chat with (especially if you're going to make it to any events beyond this one). Tickets are $15, available at the door only, and in the past the two of us have been able to drink through all of the beers by sharing. There's always something beer-and-food going on at Culmination and after last year's success Artisinful! is returning for its second year. Tickets are required to attend ($21) and include entry to the Chocolate Hall where 8+ local chocolatiers will be sampling and selling their chocolate, a $5 certificate good toward the purchase of chocolate, tasting glass and four tasting tickets. The tap line up will include 10+ beers that either have chocolate in them or have been selected because they pair well with chocolate. Call it an early Valentine's celebration or preparation for Valentine's Day but if you love chocolate we're told this is a not-to-miss event (which is expected to sell out again this year although tickets were still available as of 7am Friday). 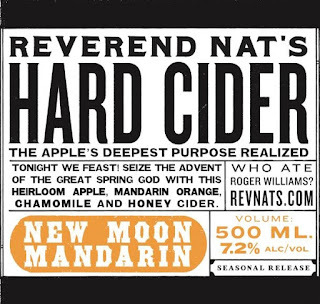 Technically not a "beer" event, most beer drinkers also at least dabble in cider and for our money, Reverend Nat's makes some of the best. New Moon Mandarin was made by "channeling the best champagne mimosas" using heirloom apples that were fermented with a champagne yeast and blended with orange and lemon zest, a complex background of chamomile, fennel, coriander and cardamom, finished with a touch of orange blossom honey. 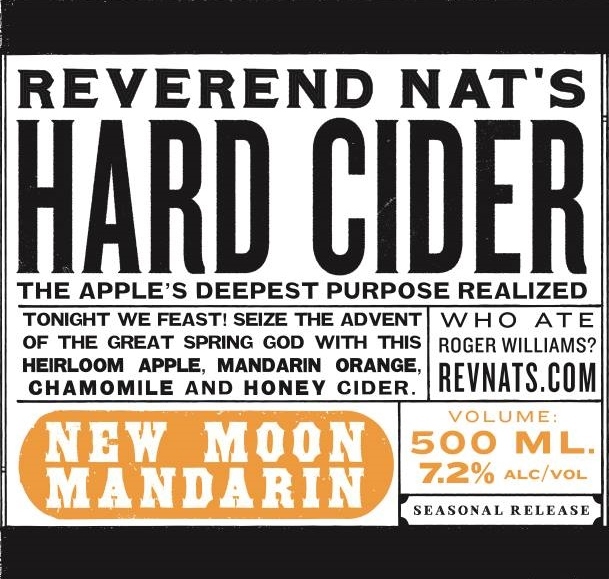 The cider will be available on tap, in bottles to go AND through a special randall with fresh mandarins. To accompany the cider Chinese Lucky Dragon Food Cart will be slinging crab puffs, Buddah skewers, pork belly bao, pork and vegetable pot stickers and mar far chicken wings. With home brewing nearly as big as commercial brewing (maybe bigger) this is one of the events throughout the year that celebrates the two. From 1-3pm attendees can sample and vote on 12 stouts that were advanced from the Portland Brewers Collective Stout Bout Home Brew Competition for free and purchase raffle tickets. For the second half of the event winners, both People's Choice and those from the judges, will be announced along with raffle winners. 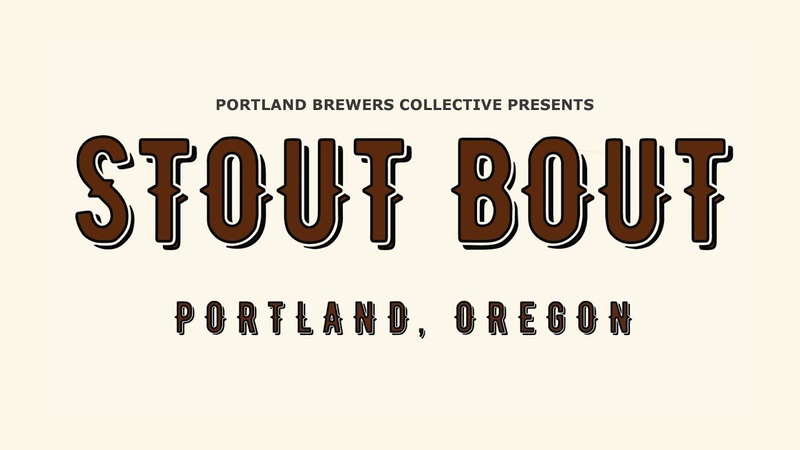 This event showcases the collaborative spirit and creativity of 15 of Portland's breweries. Attending the event means all of the beers will be available in one space but if you don't make it they will be popping up at the breweries around town in the coming days/weeks. General admission tickets are $25 +fees and include festival mug, beer festival passport and 8 tasting tickets. For those looking to get a jump on things, $40 +fees VIP tickets allow for early entry at 1pm and an upgrade from festival mug to a festival branded Miir stainless pint along with the aforementioned items. If you're going to try to make it to all five events, godspeed. There are sure to be motivated folks who will do so; others (like us if we were in town) would probably just pick one (maybe two) to fully enjoy. But whatever you do, pick at least one (for us, if for no other reason). Cheers! 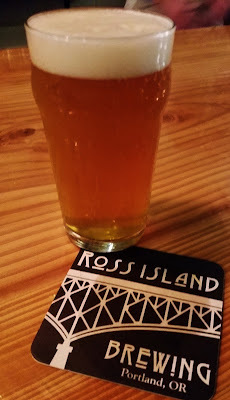 We recently had the distinct pleasure of attending a sneak peek of Ross Island Brewing. Nearly a year and a half in the making you can guess how excited owners Cartson and Maude Haney are to finally be able to open their doors to the public TODAY at 3pm. TNT IPA - A collaboration with Alameda Brewing Co. (where Carston brewed for six years), the 6% beer was brewed with a new hop variety named TNT and should suit hop heads quite well with its pleasant, lingering bitterness. Bad Precedent Vienna Lager - Brewed with Burnside Brewing a week after November's presidential election and aptly named, this interpretation of the style is well balanced and without being overly sweet. Strong Ale - The highest ABV of the three collaborations yet still a drinkable 8.1% it was brewed with Culmination Brewing "in celebration of the camaraderie of all things beer." 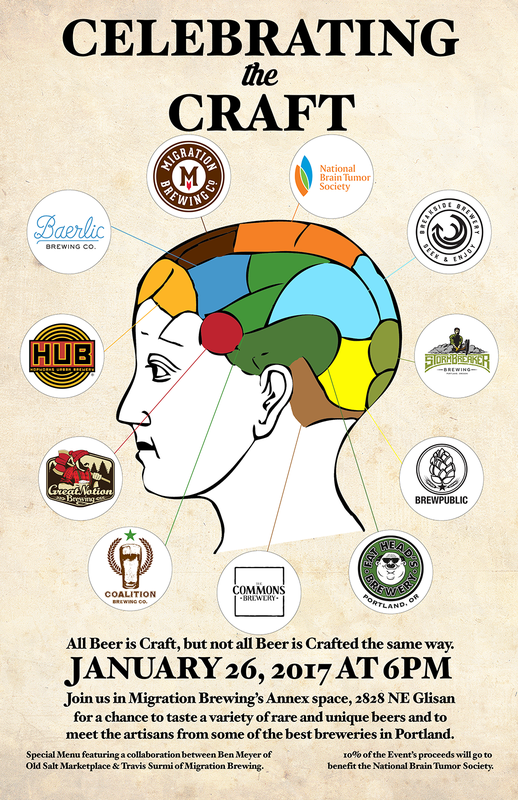 Long live the collaborative craft beer community! 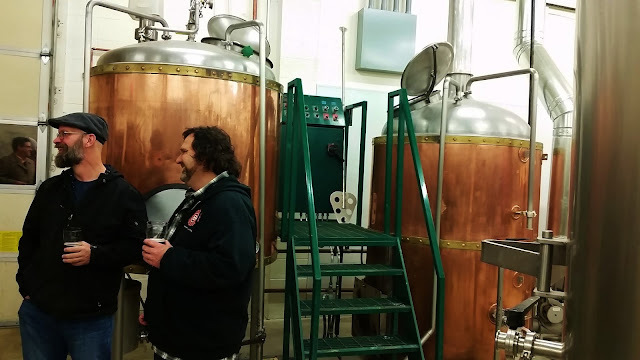 Collaboration beers are something that seems to be a trend with new breweries and a great way for them to open with something that they made, even in part, on tap before they are able to start brewing on their own system. 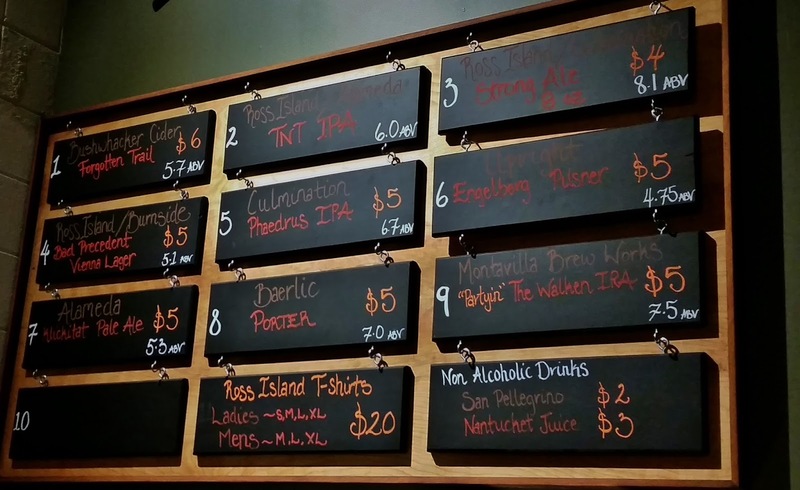 Beyond the collaborations the tap list is rounded out with a selection of guest beers and cider. As for the space, a former car stereo installation business, it has been very thoughtfully laid out to maximize the seating. Two bars, one the standard height and the other the required handicap accessible height, each seat four to five patrons and frame the east side of the rectangular space. A third bar-style seating area looks out onto Powell from the north side of the space through large windows. Continuing around the perimeter, the southwest corner offers bench/booth seating for two tables with chairs opposite. The middle is filled, but not over filled, with four-top tables. The décor has an outdoorsy feel that includes a canoe (aged to decoration perfection albeit no longer water tight) hanging above the bar. Painted in warm tones that compliment the wood tables and benches (crafted from old 2x4s from the space) and slab bar tops (gigantic wood slabs liberated from the shed of a friend's dad) the space manages to feel cozy in spite of the cement floor and a wall of windows. Located on the busy stretch of Powell Blvd just east of the Ross Island Bridge, their visibility is good but getting there is a tad bit trickier due to Powell's center median and near constant traffic. From most directions (other than having just come east across the bridge), take 11th Ave/Milwaukee Ave. The first westbound street south of Powell is Franklin (the Bear Paw Inn is on the corner if you're more of a landmark person). Take that west to 7th Ave and turn right. Follow 7th as is goes downhill back toward Powell, taking a right onto Powell for just a few feet before taking another right directly into their parking lot. Migration Brewing and eight other Portland breweries will be Celebrating the Craft of brewing beer Thursday evening in the Annex space. In addition to a line up of rare and unique beers there will be a special food menu showcasing a collaboration between Ben Meyer of Old Salt Marketplace and Travis Surmi of Migration. Here's what you can expect to enjoy. Migration TBA - did you really think you could get all the goods here? Nah, come to the event! 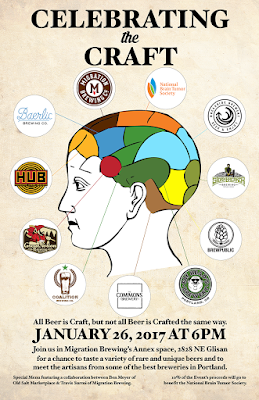 Besides just celebrating great beer and food 10% of the evening's proceeds will benefit a non-profit that is likely familiar to many local beer drinkers - the National Brain Tumor Society. Brought to our attention by Brewpublic founder Angelo De Ieso II and his fight against the Oligodendroglioma tumor that has taken up residence in his skull, this is one of the most delicious ways to contribute to his fight. So grab a friend or three and head over to try all the beer and food! Before you get any further just go ahead and get the song going (you know you want to). Ok, everyone feeling sassy? Good, now for the important stuff...beer! 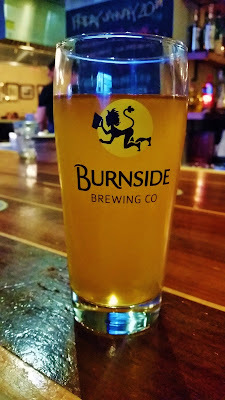 Burnside Brewing Co. has created a signature beer for RingSide named Put a Ring On It, a pale ale is made with coriander and Buddha's Hand fruit, gently hopped with Citra hops to accentuate the citrus' sweet floral fragrance and mild zest flavor. It will debut on Monday, January 23rd and be available for a special price of $4 per glass at all three RingSide properties - Fish House, Steakhouse and Grill. The beer will remain specially priced weekly on RingSide Fish House's Dollar Oyster Mondays menu 3pm to close. How long it will be available will depend on customer response and after that we have been told to expect to see another RingSide-exclusive beer from Burnside in an ongoing collaboration. As breweries and restaurants alike strive to remain relevant in the ever crowded food and beverage landscape of Portland, competing for consumers' finite dollars it's exciting to see new partnerships crop up. Only time will tell the success of this one but for those (like us) that are forever on the hunt for the next beer we haven't yet had it's worth a trip to check it out, which is what I'll be doing later today at the Fish House. See you there? Last week was a challenging one weather-wise and although that meant we spent way more time at home than usual it didn't stop us from getting out, primarily to our Cheers/Winchester to share some beer with our friends. Here's the best of what we drank. 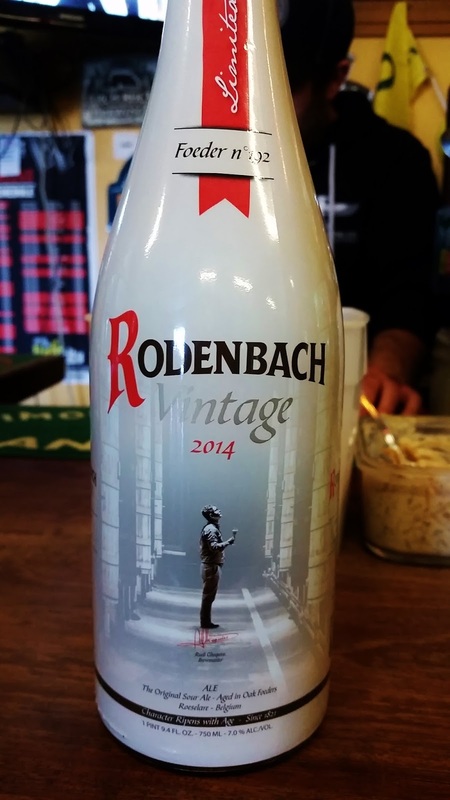 Brouwerij Rodenbach Vintage 2014 (Barrel No. 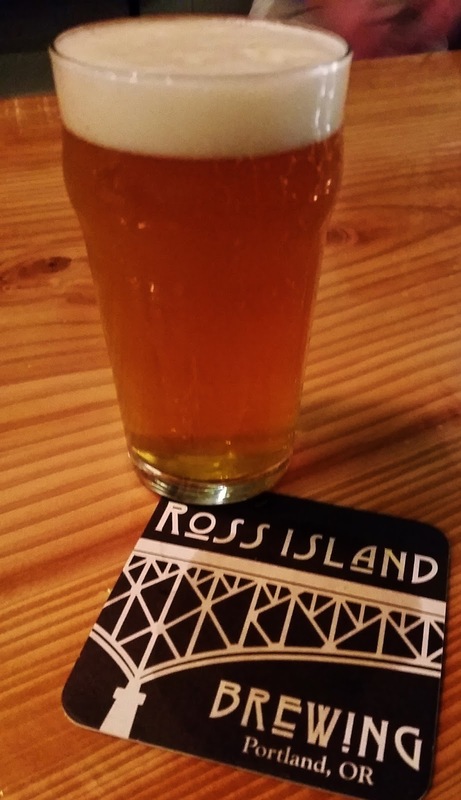 192) - Shared with us by Chris (congrats on reaching Untappd Uber level! ), this is what I refer to as a "SweeTarts" style of sour and it showcases the best of the best in the world of fruity sours. 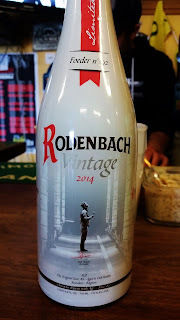 To achieve this level of amazing the Flemish red-brown sour ale spent two years in their 61-year-old foeder no. 192. Alpine Beer Company Windows Up - A moderate ABV IPA (7%) the stanky goodness from the Citra and Mosaic hops are just up this hophead's alley. Firestone Walker Sour Opal - Back to the sour well we go with this one. Firestone knows what they're doing with both sours and IPAs, a combination of talents that is quite endearing. An American Gueuze, this sour was another that took time to become what it is, spending two years in Viognier barrels. Ordnance Brewing Bläckfisk - 'Tis the season for imperial stouts and while we can't drink them all the live long day, this is one that makes us reconsider. Smooth, dark and delicious, this 9.5% beer is the kind that makes one jealously want to take to a quiet corner and keep to one's self. 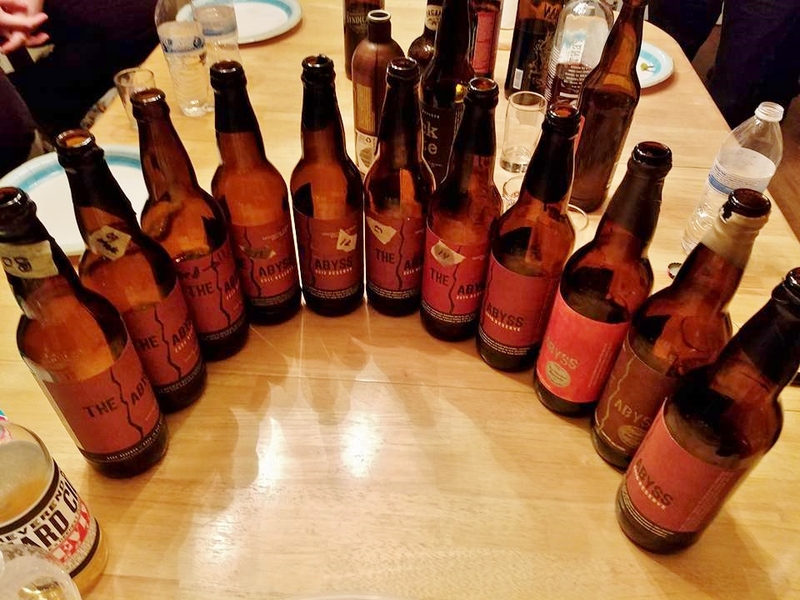 Sour beers dominated our picks slightly this week in contrast to last week's more hop-heavy best beers. Being our two favorite styles that will probably be a trend it's nice to run across stellar ones of other styles to remind us not to get into a rut. An epic snow day seems like a good day to talk about beer, specifically the best beers we drank last week. If you have any of them at your place, dig in! Otherwise, hopefully you have something tasty sitting around or a bar within walking distance that it open because what else are you going to do when the city is shut down? Deschutes The Abyss (2009) - Opened at a friend's annual Abyss vertical party, this was my favorite of the night which ranged from 2008-2015 bottles, including the 2015 cognac and rye variants. If you are familiar with the series this was a year where some of the bottles soured and although this bottle unfortunately didn't completely sour there was a hint of it in the flavor and it was deliciously drinkable at 11% ABV. Loowit Snow's Ghost - We stopped at Loowit before the Abyss party and this golden stout floored me. 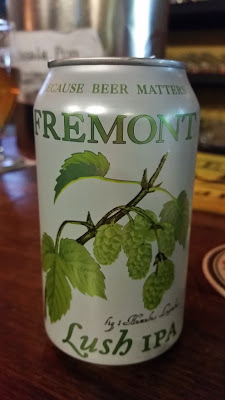 The aroma and flavor of this beer was flat out fantastic and there was something...possibly the addition of coconut and marshmallow...that set this apart from and above other similar beers. Get some if you can! pFriem Double IPA - Described as having a flavor profile of "ripe papaya, baked grapefruit and hoppy goodness" it drinks very smooth with the perfect amount of hops. Definitely one of my favorites from this brewery. Block 15 Hoppy New Year! 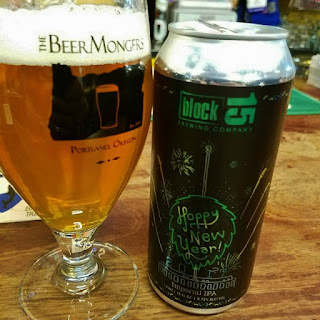 - I continue to be impressed by Block 15 and this imperial IPA continues the trend. Brewed with "citrusy and tropical hops" and generous "late-additions of Azacca, Citra, Amarillo and Mosaic hops" the result is a smooth and yummy 8.75% seasonal beer. Hopefully it portends a great year ahead. Fremont Lush IPA - The beer inside the can is as delicious as the artwork is beautiful. Using "lush, tropical hops" this hit all the right notes for me and I hope to get my lips on more before its seasonal window (January 1 - March 31) closes. "Big" (although not huge) was the theme of the best beers consumed during this first week of the new year with all but one clocking in at 8.75% or better and a sub-theme of "tropical." Perhaps it's the combination of recent crappy weather and my broken ankle-induced immobility causing cabin fever but I seem particularly susceptible to being transported to a better, tropical place at least for the duration of a pint. Thanks to Chris for his pictures of The Abyss and Hoppy New Year! Sometimes we get so caught up in the beer that we need our friends to help with the picture taking. Since 2017 started I've been contemplating what this year will hold for Beer Musings. As of late I've not felt very inspired...for multiple reasons. I briefly let the idea of calling it quits roll around in my head but it didn't seem to take hold. Hopefully inspiration will return and you'll see more content than I've been posting lately. 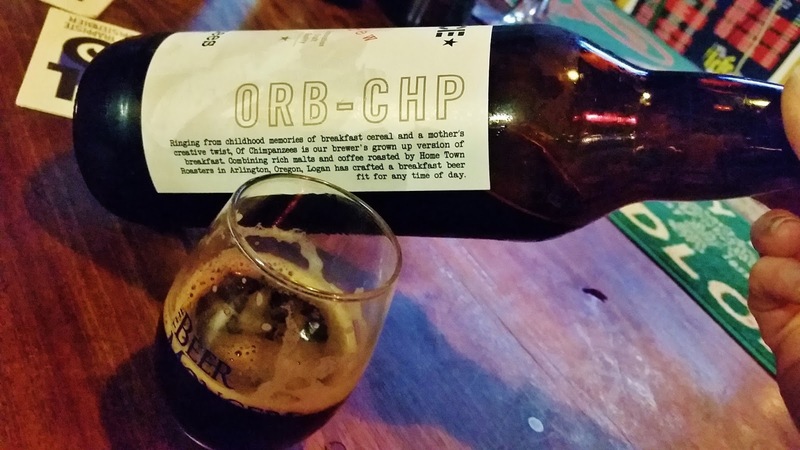 Perhaps committing to a weekly post...let's call it "The Best Things We Drank Last Week"...will be the momentum needed to get this ball rolling again. 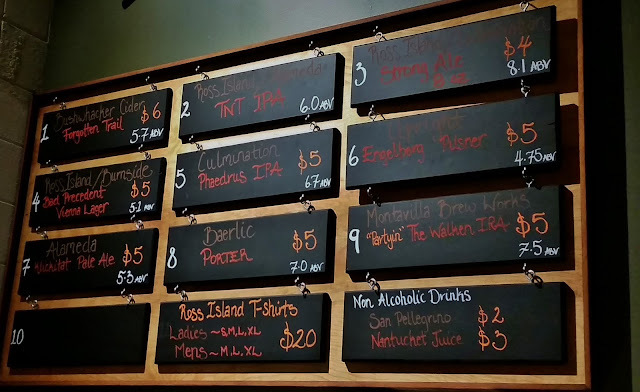 Expect to see it mid-week and while there may be some out-of-market beers listed with the wealth that surrounds us you'll likely be able to find most of it up around town. Clearly we're mid-weekend, not mid-week but as to not put off what can be done today and also because of the snow/ice/cold those of you in Portland are experiencing (hopefully weathering safely at home) here's a recap of the five best things we drank during the final week of 2016. Surly Pentagram (2015) - Cracked during our New Year's Eve gathering this sour, wine barrel aged beer is still outstanding. And at 6.66% ABV it's not gonna knock you down if you scurry off into a corner and drink the whole bottle yourself. Alesong Shake Your Tree - Matt, formerly of Oakshire, has been killing it with what I've tasted from his new venture so far. This sour ale aged with peaches smells and tastes like summer, something I need to be reminded will eventually come as we make our way through the darkness of winter. Phantom Carriage Deadly Harvest - Relatively new to the Portland market, they've made an impression on me. Another fruitted sour, this one is a barrel aged blonde made with boysenberries, a fruit that transports me back to the carefree days of gobbling down pancakes soaked in Smucker's Boysenberry syrup. 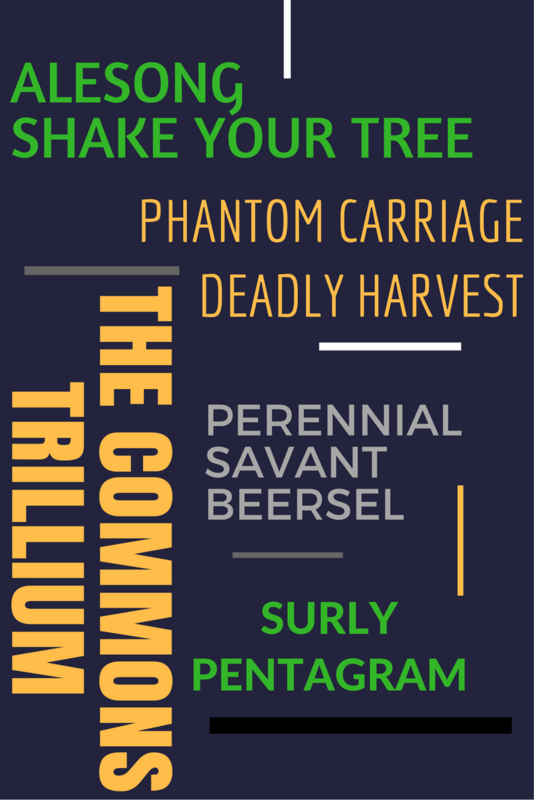 The Commons Trillium - Easily one of my favorite Portland breweries, they know what they're doing with farmhouse beers and hit particularly high notes when they make sour ones. "Sweet Tarts in a glass without being gimmicky" was my impression as I thoroughly enjoyed it with the friends who so graciously shared it. 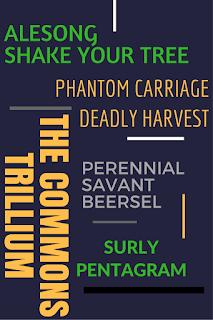 Perennial Savant Beersel - I do love me some Brett and this beer, made with wine grapes and aged in French oak Cabernet barrels is "all that and a bag of chips." 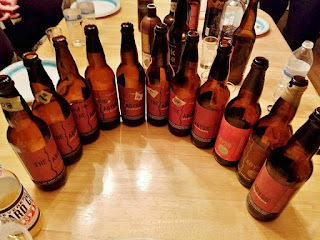 Clearly sours are one of my favorite styles and I had a wealth of delicious ones to close out a year that most of us can agree was quite sour. Thank goodness "sour" beers like these are the polar opposite of a "sour" year. Cheers to more delicious beers in 2017 and a year that is hoppy...happy...whatever!